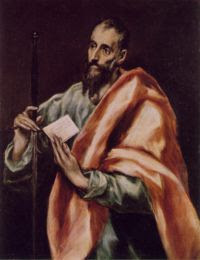 2000th Anniversary of the Birth of Saint Paul the Apostle: "Faith is not a theory or an opinion but the impact of love"
"His faith is the experience of being loved by Jesus Christ in a completely personal way; it is the awareness of the fact that Christ has faced death not for some anonymous person, but out of love for him - for Paul - and that, as the Risen One, he still loves him. Christ gave himself up for him. His faith comes from being transfixed by the love of Jesus Christ, a love that shakes him to his core and transforms him. His faith is not a theory, an opinion about God and the world. His faith is the impact of the love of God on his heart. And thus his faith is itself love for Jesus Christ." --From the homily with which Benedict XVI commenced the Pauline Year in Rome at the basilica of Saint Paul Outside the Walls, Vespers, 28 June 2008. Pray for unity within the Church. We might also say that where there is no charity one cannot find the presence of the Lord. Charity begins at home. The true home on earth of the Lord is His Church. Let all the earth know the Lord through the love we have for one another. "O God, Who settest straight what has gone astray, and gatherest together what is scattered, and keepest what Thou hast gathered together: we beseech Thee in Thy mercy to pour down on Christian people, the grace of union with Thee, that, putting disunion aside and joining themselves to the true shepherd of Thy Church, they be able to render Thee worthy service." The devil attacks the Father through His children in Christ. Do not give the Evil One any room in this House. Love your neighbor. Pray for your persecutors. Bless those who curse you. Love those who hate you. he who made heaven and earth." Photo: Daily Mass chapel, Church of Saint Peter in Olney, Maryland. Altar and ambo are of Roman travertine marble. Skylights bathe the space in natural light. the offices of the house of David." Kneeling to receive communion in the mouth a "norm valid for the entire Church"
L'Osservatore: "...In the recent visit to Santa Maria di Leuca and Brindisi, the Pope has distributed communion to the kneeling faithful in the mouth. Is it a practice destined to become usual in papal celebrations?" Monsignor Marini: "I think so. Regarding it, it should not be forgotten that the distribution of communion in the hand still remains, from a juridical viewpoint, an indult from the universal law, granted by the Holy See to those Episcopal Conferences which have made a request for it. 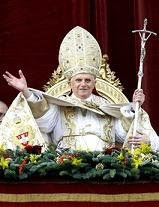 The mode adopted by Benedict XVI tends to underline the force of the norm valid for the entire Church. In addition, a preference could perhaps be seen for the use of this mode of distribution, which, without eliminating anything from the other, puts into light better the truth of the real presence in the Eucharist, aids the devotion of the faithful, introduces with greater ease the sense of mystery. Aspects which, in our age, pastorally speaking, it is urgent to underline and recover." Photos, top: the Holy Father gives Communion to a first communicant kneeling and in the mouth in Rome for the Solemnity of Corpus Domini this year; bottom: Master of Papal Liturgical Ceremonies, Monsignor Guido Marini. If God already knows what will happen, if He always wants what is good, why do we pray? Is it not insulting to God to ask Him for something good as if there is a possibility that His love could allow anything less? We pray because Christ Himself prayed, saying: "Father, not My will but Thine be done." We pray because we are sinful and do not love as God loves and do not desire good as God does. We pray because Christ taught us to pray. Not only do we have the "Our Father" which is the text of prayer and catechism of prayer which Christ the Lord Himself conferred. We also have in the holy Mass the most perfect and efficacious of prayers. The Mass is Christ Himself at prayer in His self-offering on the Cross and, in Communion, Christ Himself Resurrected truly present Body, Blood, Soul and Divinity. We pray because Christ commanded us, "Pray always". Thus the Church universal prays the Liturgy of the Hours every day in every place until the end of the world. And Mary, our Mother, prophetess of the end times, begs us, "Pray and do penance". Special thanks to Patrick Rose, member of the Liguori Society, for posing this question. “First you will see me, then you will not see me, then you will see me again.” With these words Our Lord refers to His Paschal Mystery and instructs us to look forward in hope to His coming again at the final judgment. In a less serious vein, these words apply very well to my own life here among you, the blessed people of God at Saint Philip’s. You have seen me come from military duty, and then depart for Iraq, and then return to you again. And through it all you accepted with faith, persevered in hope, and supported with prayers and actions of love. You have been a tremendous solace, an example, and a true family of faith. “I am a pilgrim on the earth, like all my fathers before me”. These words of the Psalms well describe the life each one of us enter into upon our baptism as people of faith who do not find here on earth a lasting city. Our thoughts are above, with Christ the Lord, seated at God’s right hand. Archbishop Wuerl has invited me to set out again as a pilgrim and so it is time to bid you “arrivederci” once more. The Archdiocese is rich in people but sometimes not so wealthy when it comes to workers for the vineyard. For this reason our leaders must be careful to distribute God’s gifts prudently and wisely among His people. This often necessitates the transfer of our priests. I promised obedience to Cardinal Hickey, and all his successors, at my ordination. In this, as in all matters of obedience, it is the Lord whom I truly serve and obey. In this way I also truly serve His people in a more generous expression of His love. As people of Faith, we above all others have a right to say: ”See you again!” We sincerely mean it, as we all look forward to our heavenly home reunion at the end of our pilgrim way on earth. I say the same, and truly hope that you will come for a visit with my new family at Saint Peter’s in Olney. I have often told you in jest, and I say it again now, “I have much more to tell you, but you cannot bear it now” as our Lord did upon departing from His Apostles. How wonderful are the riches of wisdom, knowledge and grace that the Lord has yet to reveal to us in the journey ahead! For this reason we are hopeful in Christ, as our Holy Father Benedict so beautifully and so often invites us to be. May He always be your hope and mine, all the days of our lives! Photo: Patronal window in Saint Philip's rectory chapel. What is our value? From where does it come? Who decides for us our value or worth? Shall it be the world? Or God? "Even all the hairs of your head are counted. If we would accept our true value then we must accept the Fatherhood of God and testify to Him before the world. If we would know and rejoice in our infinite worth, "more than many sparrows" we must be known by our lives as true children of the Father in heaven whose love in Christ as the gift of the Spirit is the source of our value and worth. Meeting Christ in the Liturgy offers a reflection for The Twelfth Sunday of Ordinary Time. July, 1968. Forty years. And workers at Catholic Charities in Richmond do not know contraception is a moral evil and procured abortion is an abominable crime? What part of Humanae Vitae do you not get? "Catholic Charities of Richmond, Inc, an agency of the Diocese of Richmond, Virginia, first provided a "contraceptive device" to a poor 16-year-old Guatemalan girl. Then, according to Federal authorities, Catholic Charities' "members signed the consent form necessary for a minor to have an abortion and had someone drive her to and from the abortion clinic" in January 2008. "This is much more scandalous than the child abuse crisis. This is murder! Heads must roll, and not just those of the employees, but mainly that of the overseeing Bishop. He must resign. "Catholic Charities of Richmond is obviously out of control; the overseer (επίσκοπος) of all Catholic activities related to the Diocese of Richmond is its Bishop, Francis Xavier DiLorenzo. What took place under his watch was no mere "incident". It was the death of an innocent human being, placed by Divine Providence under the care of a Church agency, whose overseer was and is the Bishop. He must resign. "The national network of Catholic Charities, Catholic Charities USA, rightly identified the responsible authority, Bishop DiLorenzo, noting that "[Catholic Charities of Richmond] is incorporated under the leadership of the Richmond Diocese and that the bishop serves on [its] board". This Bishop is responsible for the great tragedy and sinful death that took place under his authority. He must resign. "The culture of death is entrenched in the main work of "outreach" of his diocese. An apologetic letter to his fellow Bishops - a secret letter! - is certainly not enough. This Bishop is the overseer of a murderous organization. This Bishop is a shame to the Catholic Church. He must resign. Many thanks to rorate-caeli.blogspot.com for bringing this to attention. God have mercy on this anti-life world! Meeting Christ in the Liturgy offers a reflection for The Eleventh Sunday of Ordinary Time. An 18-year-old English woman died after taking two abortion pills. The dead unborn child, "retained products of conception", within her womb was partly credited with causing her death. Inquest Told Teen Died After Taking Abortion Pills. Creative lying. With what strenuous verbal gymnastics do we avoid the truth about life and death. The contraceptive mentality has made a death chamber even of the sacred place where life must begin. Father Frank Pavone and Priests for Life deserves your dedicated awareness, prayers and support. Please visit the web site and see how you can them in their powerful apostolate to support priests as agents for life in all the work they do. Thanks to David B. for reminding. 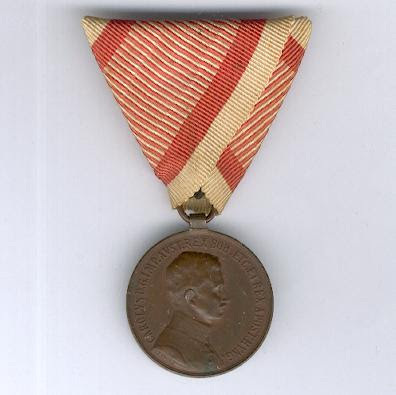 Medal for Bravery, bronze (Bronzene Tapferkeitsmedaille), Emperor Karl I, 1917-1918 issue. Just received the gift from Byron in Austin, Texas, of the Breviarum Romanum and this medal of Blessed Emperor Karl, perhaps presented to one of his soldiers by the Blessed himself. Gratias tibi ago! Blessed Charles I of Austria and his wife Zita, who bore him eight children, are good patrons in this season in which we mark the 40th anniversary of Humanae Vitae. 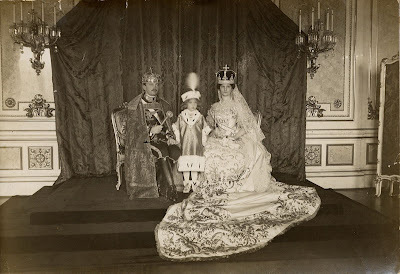 Blessed Emperor Karl with consort Zita and son Otto. 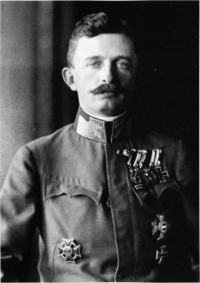 O Blessed Emperor Karl, you accepted the difficult tasks and burdensom challenges God gave you during your life. In every thought, decision and action you trusted always in the Holy Trinity. We pray you to interceded for us with the Lord our God to give us faith and courage, so that even in the most difficult situations of our earthly lives we may not lose heart, but continue faithfully in the footsteps of Christ. Ask for us the grace that our hearts may be molded into the likeness of the Sacred Heart of Jesus. Help us to work with compassion and strength for the poor and needy, to fight with courage for peace in our homes and in the world, and in every situation to trustingly place our lives in the hands of God, until we reach Him, as you did, through Christ our Lord. Amen. The position for life, the decision for life, is not religious right, religious left or religious at all. The decision for life is a reasonable act of the intellect. The human intellect by the light of natural reason alone is capable of understanding that either all life is good and worthy of protecting, defending and respecting or none is so. People of faith should be the first to enunciate this truth. Life will triumph. Love is stronger than hate. Every use of artificial contraception continues to be, as it has always been, an intrinsic moral evil. The official promulgation of this fact in the encyclical Humanae Vitae in 1968 simply continued the Church's consistent ethic of life. "My Predecessor of venerable memory, the Servant of God Paul VI, published, on July 25, 1968, the Encyclical Letter Humanae Vitae. That document very soon became a sign of contradiction. Written under the light of an excruciating decision, it constitutes a significant gesture of courage in the confirmation of the continuity of the doctrine and of the Tradition of the Church. That text, often misunderstood and distorted, caused much discussion, also because it was set at the dawn of [an age of] strong dissents which marked the life of entire generations. "The truth expressed in Humanae Vitae does not change; rather, in light of the new scientific findings, its teaching becomes even more up to date and induces reflection upon its intrinsical value. "The teaching expressed by the Encyclical Humanae Vitae is not easy. It is, nonetheless, pursuant to the fundamental structure by which life has always been transmitted, since the Creation of the world, in respect of nature and in conformity with its demands. The concern for human life and the safeguard of the dignity of the person impose upon us not to leave anything untried so that it may be shared with all people the genuine truth of responsible conjugal love in full adherence to the law written in the heart of every person." As did Abraham before us, we trust that God can keep His promises. Meeting Christ in the Liturgy offers a reflection for The Tenth Sunday of Ordinary Time. Kneel or stand? On the tongue or in the hand? What's a Catholic to do? List to Bishop Robert Morlino! "I found a wonderful homily by Bishop Robert C. Morlino of the Madison, WI diocese on the Feast of Corpus Christi. He talks about the reverence we should have when receiving the Eucharist. He talks to the congregation about how he set up 6 kneelers in the front of the church for the Mass and invites the people to receive Communion while kneeling and on the tongue." In the video Bishop Morlino is recorded saying, "You always have the freedom to receive in the hand or on the tongue. I repeat, you always have that freedom." The bizarre "Logic of Death"
She decides to "terminate" because "I couldn't cope with the anguish of losing another baby"? "I was on the (birth control pill) when I became pregnant," Percival, 25, said. "Deciding to terminate at eight weeks was just utterly horrible but I couldn't cope with the anguish of losing another baby." Artificial contraception and abortion are two ends of the same spectrum. 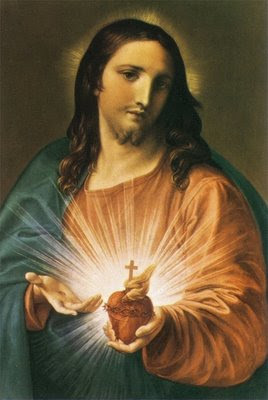 A blessed month of June, dedicated to the Sacred Heart of Jesus, to all our readers. Tradition is not a ghetto within the Church! 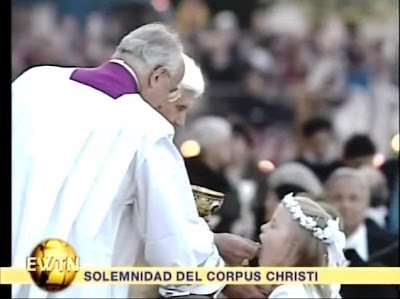 Cindy Wooden of the Catholic News Service was quick to rush into print a very facile and ill­-considered story about the faithful who knelt to receive Communion on the tongue from the Holy Father at Rome’s celebration of Corpus Domini on May 22. “ Vatican: Receiving Eucharist Kneeling May Not Be Permanent Change” read the headline of the story which sought to dis­courage any of the faithful from their logical re­sponse of learning from the Pope's encouragement to use this ancient Catholic custom. Anyone, at any time, may kneel to receive Com­munion and may do so on the tongue. No one may justly on his own authority deny the right of any Catholic to choose how she or he wishes to receive the Lord in Communion at Mass. The Vatican state­ment was intended only to affirm that this one in­stance at the liturgy of Corpus Domini may not be interpreted to mean that any and all liturgies in the future will closely adhere to it as a prece­dent. The rigid progressivists of the failed modernist agenda, still at the helm of so many bureaucracies in the Church and her support structures, chan­cery offices, and religious education offices, con­tinue to use all the means at their disposal to spin every event to serve their agenda. It is quite a twist to say that kneeling and receiving Com­munion on the tongue is a passing fancy and won’t be around for very long. It is, in fact, the modernist aberrations which have been around for a very short time, 40 or 50 years at the most, and which will in fact, sooner rather than later, be buried unceremoniously in the dustbin of li­turgical history. It is to kneeling, receiving on the tongue, the customs of eucharistic processions at Corpus Chris­ti and patens for Communion and other immemo­rial practices of devotion that young people are more and more attracted. I had a discussion recently with the young men of the The Liguori Society about the logic of liturgical piety in the Holy Mass that recommends kneeling for receiving Communion. I asked, if by our imme­morial practice it is our custom to kneel in the Mass when the Lord becomes present upon the al­tar, is it not simply consistent and entirely appro­priate to kneel also when not merely adoring but in fact receiving God Incarnate in the Eucharist? And, if we bow when we recount the words of the Creed which merely mention the fact of the Incar­nation of the Word, how much more ought we kneel when receiving the Word Incarnate truly present? One young man responded enthusiastically to the logic of this reasoning and declared his inten­tion to begin kneeling to receive our Lord in the Communion of the Mass. I warned him that it must be his decision alone in conscience to do so, and not merely because I provoked the discussion. As a priest and celebrant I will never pretend to have the authority to deny any of the faithful the right to receive their Lord on their knees at Mass, while continuously encouraging those who have lost all practice of our Catholic customs of adora­tion and reverence to bow before approaching the Eucharist as our bishops have asked us to do. 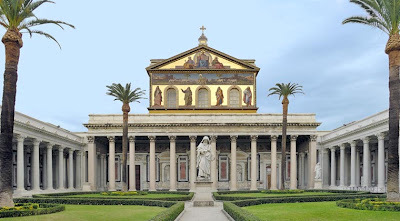 Cindy Wooden refers to a response from Rome about reception of Communion both kneeling and on the tongue by the four dozen people who re­ceived the sacrament from the Holy Father on May 22. “ In a brief e- mail to Catholic News Service May 23, Msgr. 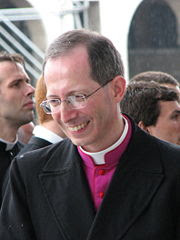 Guido Marini, master of papal li­turgical ceremonies, said the decision ‘ was a solu­tion adopted for [ the Feast of] Corpus Domini,’ but as for the future, ‘ We’ll see’.” The Holy Father may choose in the future to speak at length about this topic, but his example remains far louder and more effective than any words. Regardless, Catholics remain free to express their personal piety using any of our Catholic cus­toms. Vatican II guarantees nothing if not endless “ options.” These options always and in every cir­cumstance include the most ancient and immemo­rial of our traditions. Archbishop Albert Malcolm Ranjith Patabendi­ge Don, secretary of the Congregation for Divine Worship and the Discipline of the Sacraments, told CNS that the “ gesture of the Holy Father” at the May 22 Mass “ is to be appreciated. 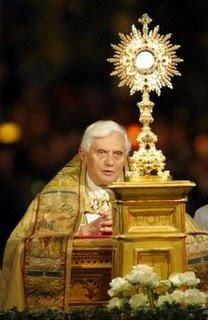 It brings out in a better way the fact that we adore the Lord whom we receive” in the Eucharist. Tradition is not simply a ghetto within the Church. Rather, the Church herself is Tradition and without tradition there is no Church. All that we have, are, and believe in Christ has been handed down. Continuity with the tradition, the “ handing on,” is continuity with Christ Himself who Him­self hands it on through the power of the Holy Spir­it. Our customs surrounding the most sublime Sac­rament of the Altar are among the most important, concerning themselves as they do with the True Eucha­ristic Presence of the Divine Lord Himself. Let us each follow our consciences as we seek to adore the Lord in word and action especially as He is truly present, the Bread of Life. A sample of Father Cusick's column "A Leaven in the World" appearing weekly inThe Wanderer Newspaper.